Tradional herb used for liver and gall bladder problems. 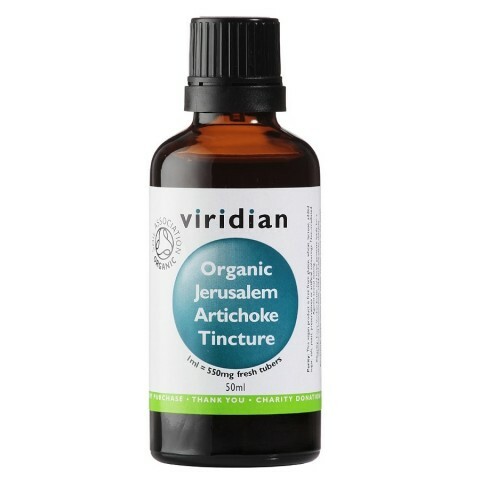 Viridian's 100% Organic Jerusalem Artichoke tincture is made with the fresh tubers of Helianthus tuberosus. Tradional herb used for liver and gall bladder problems. You might also be interested by more information. below refers to using the fresh artichoke and not necessarily the supplement. Jerusalem artichoke is moderately high in calories; provides about 73 calories per 100 g, roughly equivalent to that of potatoes. The root has negligible amounts of fat and contains zero cholesterol. Nevertheless, its high-quality phytochemical profile comprises of dietary fiber (non-starch carbohydrates), and antioxidants, in addition to small proportions of minerals, and vitamins. It is one of the finest sources of dietary fibers, especially high in oligo-fructose inulin, which is a soluble non-starch polysaccharide. Inulin should not be confused for insulin, which is a hormone. The root provides 1.6 mg or 4% of fiber. Inulin is a zero calorie saccharine and inert carbohydrate which does not undergo metabolism inside the human body, and thereby; make this tuber an ideal sweetener for diabetics and dietetics. Soluble as well as insoluble fibers in this tuber add up to the bulk of food by retaining moisture in the gut. Studies suggest that adequate roughage in the diet helps reduce constipation problems. Dietary Fibers also offer some protection against colon cancers by eliminating toxic compounds from the gut. The tuber contains small amounts of anti-oxidant vitamins such as vitamin-C, vitamin-A, vitamin-E. These vitamins, together with flavonoid compound like carotenes, helps scavenge harmful free radicals and thereby offers protection from cancers, inflammation and viral cough and cold. Further, Jerusalem artichokes are an excellent source of minerals and electrolytes, especially potassium, iron, and copper. 100 g of fresh root holds 429 mg or 9% of daily required levels of potassium. Potassium is a heart friendly electrolyte which brings reduction in the blood pressure and heart rate by countering pressing effects of sodium. 100 g of fresh sunchoke contains 3.4 mg or 42.5% of iron, probably the highest amount of this trace element among the common edible roots and tubers. It also contains small levels of some of the valuable B-complex group of vitamins such as folates, pyridoxine, pantothenic acid, riboflavin, and thiamin. Directions: Take 15 - 30 drops, 2 -3 times daily in a little fruit juice or water.